Replica of Harald Bluetooth’s rune stone from Jelling in Rouen. Photo: Anne Pedersen. In 1911 the city of Rouen celebrated the millennium of the founding of the Duchy of Normandy and the baptism of the Viking King Rollo. The Danish Carlsberg Foundation donated a replica of King Harald Bluetooth’s rune stone in Jelling to the city, made by the sculptor H. Chr. Petersen. 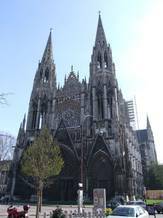 Today the replica is located in the Jardin des Plantes, outside Rouen’s impressive St-Ouen Church, close to the rose window in the southern transept. Northern France was the target of numerous Viking attacks. A battle is recorded between Charles the Simple and the Vikings led by Rollo near Chartres in 911. Following the battle land was ceded to Rollo and his followers. In return Rollo was to defend the Seine against other Viking intruders and submit to the Frankish king. The chronicler Flodoard states that Rollo was baptized and given the Frankish name Robert. He married a Christian woman and his son William Longsword became a key figure in the development of Normandy. The St-Ouen Church in Rouen. Photo: Benedicte Guillot. The St-Ouen Church in Rouen. The city hall has overtaken the two old cloister buildings that were built together with the church. The copy of the rune stone stands in the associated park. Photo: Benedicte Guillot. 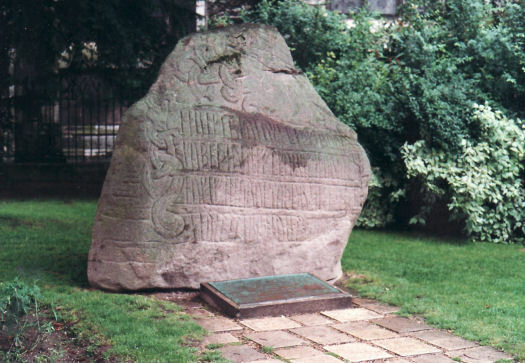 Plaque next to the replica of Harald Bluetooth’s rune stone in Rouen. Photo: Benedicte Guillot.